functional, for example indicating one's lineage” (Coleman). Scarification is the act of taking a sharp object such as a knife or a rock and cutting the skin with it in certain patterns with the aim to leave raised scars on the person’s skin. “Cicatrisation is a special form of scarification, whereby a gash is made in the skin with a sharp instrument, and irritation of the skin caused by applying caustic plant juices forms permanent blisters. Dark pigments such as ground charcoal or gunpowder are sometimes rubbed into the wound to provide emphasis” (Coleman). Scarification can be used to show one’s social status, ethnic group, or family. Scarification in some tribes, such as the Tib in Nigeria, use scarification to show where a girl is in her life (adolescent, puberty, adult) or to show how ready she is for reproducing. 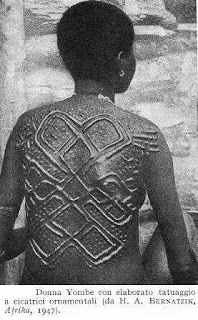 Though in the United States extreme body art is seen as something usually done by the rebels and outcasts of society, ‘”Scarification and other forms of body decoration were traditionally considered marks of civilisation. They distinguished the civilised, socialised human body from the body in its natural state and from animals’ (Vogel.1986.p.25)” (Coleman). Coleman, Helen. "Scarification among African cultures." Scarification and Cicatrisation among African cultures. Nov. 2002. 29 Apr. 2009 .